In full scuba gear, we roll off a small open, outboard-powered boat into the clear water. We’re in a shallow bay near the southern tip of Baja California, in the middle of the Cabo Pulmo National Marine Park. Here, the Sea of Cortez blends with the Pacific Ocean. Looking back to the shore one last time before we submerge, we see stunning mountains, undeveloped desert and jagged cliffs that give way to a pristine white sandy beach. The boat’s bottom grows smaller as we descend slowly toward the reef below, where we begin to catch sight of coral colonies, marine terraces and basalt bars. 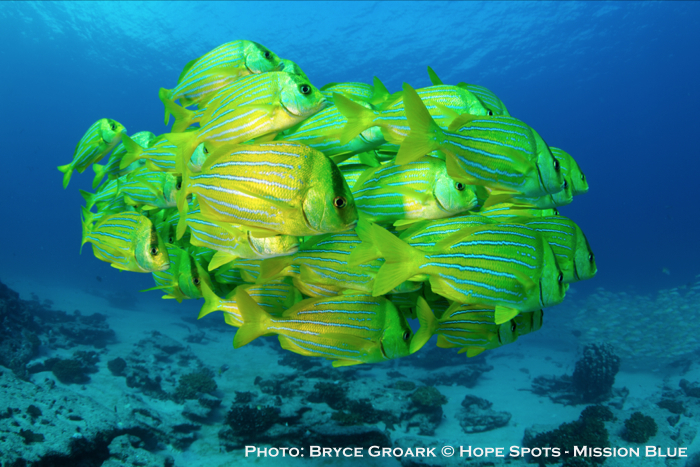 A slight undercurrent pushes us through the water, schools of big-eyed jacks, yellow snappers and amberjacks seem to swarm around us as they swim by in groups of more than 40. Looking down at the reef, hogfish peak out from behind large sea fans. Upon closer exploration of the volcanic reef, single coral polyps become visible and small invertebrates seem to scurry over the coral’s surface. Following a sand channel that winds through the reef, we spot a sea turtle that appears to be resting on a reef ledge. Together, the variety of species, colors, shapes and sizes bring this underwater park to life. This thriving coral reef is estimated to be 20,000 years old. But, as we stop to watch the sea turtle, a small golden grouper swims by and I am reminded that it was not that long ago that this reef was on the verge of collapse. In the 1990s, decades of destructive overfishing in the area left the coral reef degraded and the ecosystem depleted. 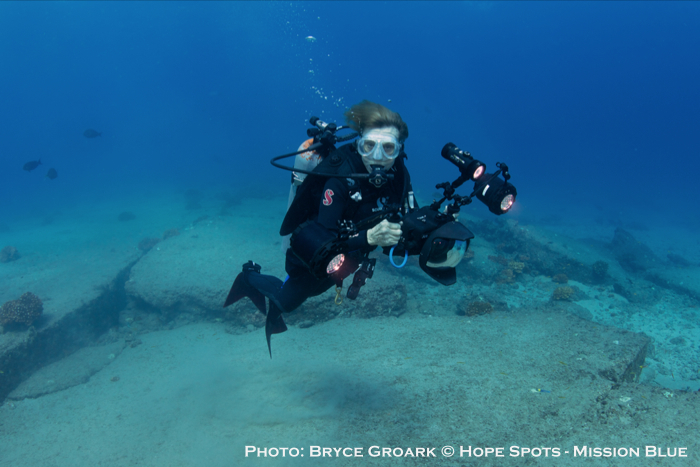 National Geographic Explorer-in-Residence Dr. Sylvia Earle explores the reef. When locals recognized the damage being caused by rampant overfishing they petitioned the government to make the area a national park, which it did in 1995. 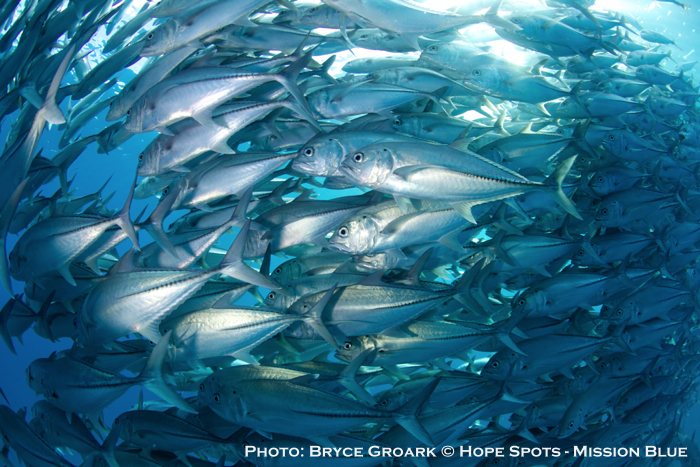 A 17,560-acre strip of marine and coastal habitat was established as a Marine Protected Area (MPA). Fishing was banned within the park and the local communities began to take stewardship of the marine area and reoriented their economies away from destructive fishing practices. As the ecosystem began to recover from certain demise, others took notice of this unique and valuable area. 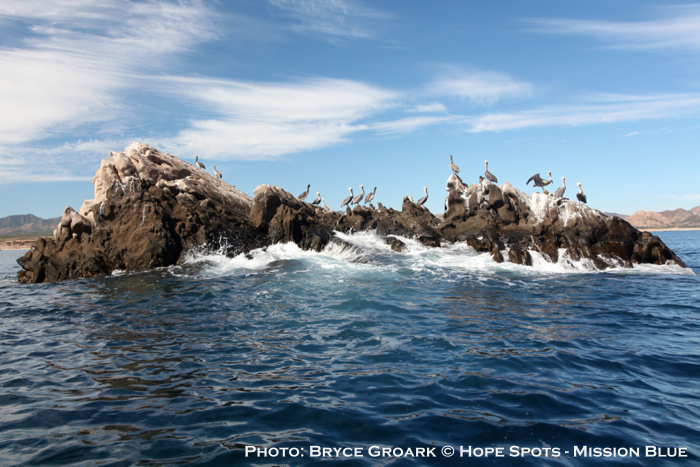 In 2005, UNESCO named Cabo Pulmo National Marine Park a World Heritage Site and in 2008 it became a Ramsar Wetlands Site of International Importance. Floating slightly above the reef, the diversity of coral species and abundance of fish that now thrive make it easy to understand why some people refer to this, once depleted, area as an “ocean miracle.” Though as I relish in the beauty, diversity and splendor of this living reef ecosystem I reflect on the real miracle — that people recognized the need to protect this amazing marine ecosystem before it was too late. No-take marine reserves have been proposed as one of the most successful tools for conservation and restoration of coastal and marine ecosystems. The thriving, diverse and plentiful reef system seen in the Cabo Pulmo National Marine Park today shows that with support and protection, degraded marine areas of great environmental and economic importance can bounce back. As we begin our ascent, the boat’s bottom begins to appear larger. Reaching the surface we leave the beautiful underwater ecosystem behind, but we take with us the knowledge of this beautiful world beneath the waves — an ecosystem that has been seen by so few, yet overlooked by so many. Climbing back into the boat and beginning the trip back to shore we are tasked with helping to identify more “hope spots,” such as the Cabo Pulmo National Marine Park, and ensuring they too are protected. 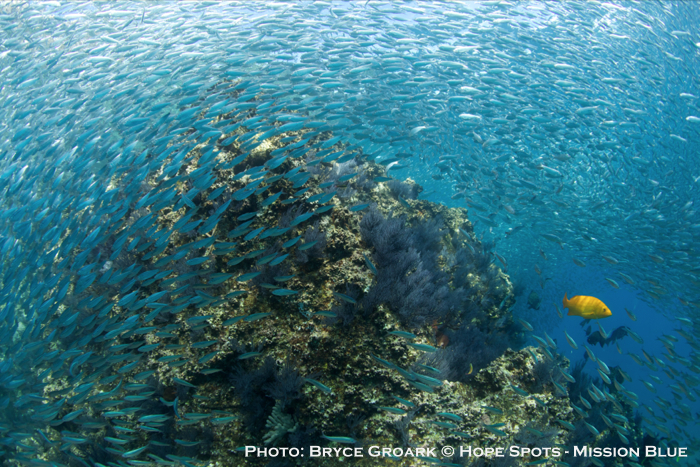 Read more about the Cabo Pulmo National Marine Park on National Geographic and see an amazing photo taken in the park by clicking HERE.